Vinyl fence removal is a fairly straightforward job. But, it does take a modicum of handyman skills and some common tools to pull off. While you don’t need to have the experience of a seasoned building contractor or carpenter, you will need a little help from a couple of people. This is due to its size and handling the various parts. With some help and a free weekend, you’ll be able to tackle a vinyl fence removal. A total dismantling of a vinyl fence can be done over a weekend or two and will require a few tools. The biggest help will be in manpower. The more people you have to help you tackle a vinyl fence take down, the faster it will go. Be sure to schedule a junk hauling and removal service to come out to pickup and haul off the fence. If you find the project is too cumbersome, a junk hauling service will also be able to tackle this odd job. When you’re ready to dismantle your vinyl fence, you’ll need a few tools, which include: a chisel, hammer, driver-driver, shovel, as well as leather gloves and eye protection. It’s best to start at one end and work your way to the other, but, depending on how many helpers you have, you can work from both ends and meet in the middle. Now, let’s get onto how to do vinyl fence removal. As mentioned, you’ll need at least one set of helping hands. Along with the help, a few common household tools. Take off the swinging gate. The first thing to do is to remove the swinging gate. This is a great place to start because it provides easy access to the posts, away from walls and other obstructions. Examine how the gate is attached, then carefully remove the hinges from the post and pull the gate away. Pull off the panels from the posts. Next, you’ll need to remove the individual panels, one at a time. As with the gate, pile these out-of-the-way so they aren’t a tripping hazard. If possible, stand them up so critters can’t hide or nest underneath. Dig up the fence posts, one-by-one. Lastly, you’ll have to remove the posts one at a time, using a post hole digger. This is the most laborious part of taking down any fence. Generally, posts are buried about two to three feet into the ground, set into concrete. 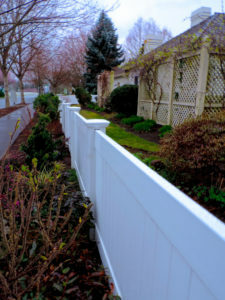 When you need help with fence disposal, just phone 800-433-1094 or visit Junk Garbage Removal.